The Meeting Room has not been immune to change. Companies no longer have the luxury of creating spaces for occasional use. A Training Room used twice a month is simply too costly. The Divisible Room was born. User simplicity and flexibility are at the heart of our Boardroom propositions. A Divisible Room is a multi-use space, used as a whole when the audience dictates, but partitioned in to smaller areas when the full area isn’t required. Think a 15m x 5m space where removable walls can make three 5m square rooms, or one 10m x 5m and a 5m square space – you get the idea. Providing AV into these spaces is particularly challenging. 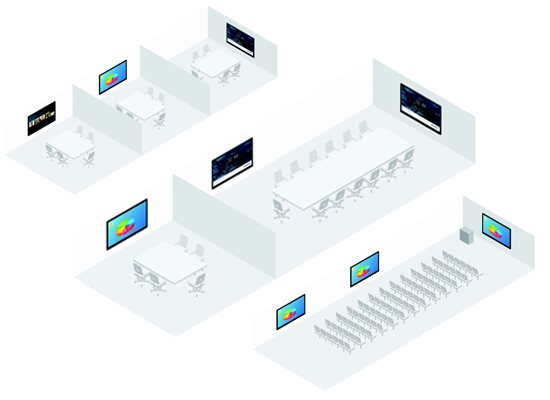 In open configuration, displays and audio need to work for an audience that could be 15m away, but this setup wouldn’t work when dividing walls are in place – the screen would be too big, the speakers not required and above all, users of each room might want to run their own content simultaneously. Of course this is manageable. City AV consult and provide an audio and visual solution that works in all scenarios. To find out more about The Divisible Room and other Audio Visual Solutions from Excell ; call on 0800 1 959 959, email us or complete the form on the bottom of this page.